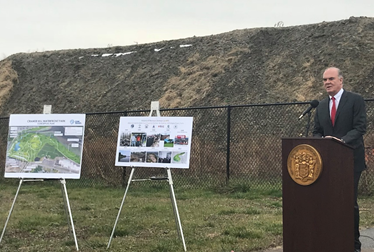 (17/P125) TRENTON – The Christie Administration is beginning the next phase of transforming a Camden landfill into a scenic waterfront park with trails, a stabilized shoreline and a fishing area after requesting bids for the multimillion-dollar project, Commissioner Bob Martin announced today. A request for bids envisions a project that has been a priority for the Christie Administration – transforming the remaining 62 acres of the Harrison Avenue Landfill into the Cramer Hill Waterfront Park with nearly a mile of shoreline that will offer passive recreation for residents and visitors. The project is estimated to cost at least $25 million and will be funded with Natural Resource Damage monies obtained by DEP through the Office of Natural Resource Restoration. Construction will be contracted through the Division of Coastal Engineering with oversight from the Office of Natural Resource Restoration and its consultant. When complete, the project will further build upon the ongoing revitalization of the Camden waterfront in conjunction with the Community Collaborative Initiative that dates back more than a decade. Transformation of the landfill into Cramer Hill Waterfront Park would give the public its first access to the neighborhood’s waterfront in at least 70 years, as well as a multitude of new park amenities. The project calls for regrading and stabilizing approximately three-quarters of a mile of shoreline along the Delaware and Cooper rivers, creating freshwater tidal wetlands, adding waterfront access to include a kayak launch and areas for fishing, connecting greenway trails to other neighborhoods, and further remediating the area for possible community gardens. An amphitheater and picnic area also are planned. Project bids are due January 5, 2018. Remediation work may begin by spring. The Harrison Avenue Landfill operated as a sanitary landfill from 1952 until 1971, but was never capped or closed. Efforts to transform the landfill into a waterfront park and community center hub date to 2004, when DEP’s Office of Brownfields Reuse began a partnership with the Camden Redevelopment Agency, local non-profit agencies such as the Cooper’s Ferry Partnership, local officials and residents, to develop the park concept and make it reality. 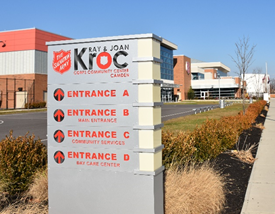 Those partnerships eventually led to the remediation of a portion of the Harrison Avenue Landfill and development of the Ray & Joan Kroc Corps Community Center after the estate of Joan Kroc contributed $59 million and private donors provided $10 million to the project. DEP also spent $26 million in Hazardous Discharge Site Remediation Fund grant money to remediate the site in 2009. The 120,000-square-foot building opened in 2014 and today provides thousands of residents in Camden and surrounding areas with a variety of education, sports, arts, social, spiritual, medical clinic, food pantry, and other programs. DEP’s successes in Camden are due in part to the work of the Community Collaborative Initiative, an outgrowth of the Camden Collaborative Initiative formed in 2013 to provide Camden with a single point of contact for DEP expertise and data-driven decision-making. The purpose of the partnership is to advance the shared redevelopment goals of various federal, state and local partners working in the city. Since then, the Camden Collaborative Initiative has resulted in investments of more than $150 million in water infrastructure upgrades and $60 million in land improvements. Those successes led Commissioner Martin to expand the Community Collaborative Initiative’s reach to include Trenton and Perth Amboy in 2015.